Kiddie X-Ball is an interactive action game designed just for kids! There are 5 exciting mini-games to choose from. Each mini-game has an interesting theme and a mission that players must accomplish by quickly tossing balls at moving targets onscreen. Hit as many targets as possible within the time limit to earn points and win tickets! New design with adjusted cabinet height encourages game play for children and multi-players. 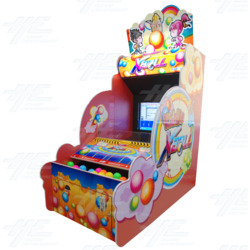 New design with adjusted cabinet height encourages game play for children and multi-players.